Special ceremony altar at Menri Monastery in Dolanji, India. Photo credit: Unknown. Traditionally, the altar is located in a higher place such as the top most floor of a building. Ideally, the altar faces East and is seen as one enters the room where it is located. If facing East is not possible, South is second best although sometimes West or North are the only available options. Ideally, the altar has three, four or five levels. Whatever is placed upon the altar should be clean, undamaged and have a sacred purpose. The altar is sometimes painted and sometimes covered with silk. Although there are specific rituals that specify the use of white or black cloths, in general the colors of white, black and green are not appropriate for the altar. When the text specifies placement of items to the ‘left’ or ‘right’, the perspective is always that of the deities. Therefore, ‘left’ becomes the practitioner’s ‘right’ when facing the altar. For example, according to the text the protectors red offering of tea or rakta is placed on the left and the white offering of alcohol is placed on the right. However, for the practitioner facing the altar, the red offering of tea or rakta is to their right, and the white offering of alcohol is to their left. Below, ‘right’ and ‘left’ are from the perspective of the practitioner facing the altar. HH 33rd Menri Trizen. Behind him and to the left are texts wrapped in red cloth on shelves above the deity statues. Photo Credit: Unknown. The Higher Levels of the Altar: It is important to have representations of enlightened Body, Speech and Mind on the altar. 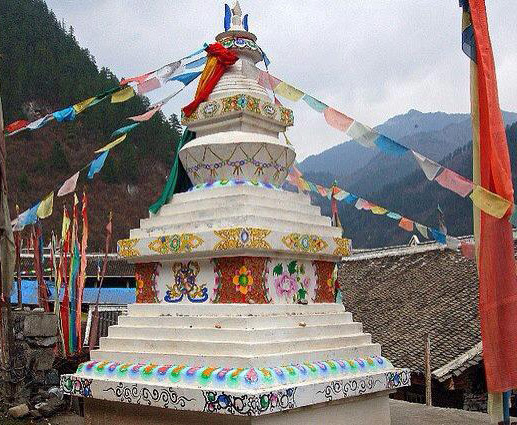 Enlightened Body is represented by statues and images such as thangkas, enlightened Speech is represented by texts, and enlightened Mind is represented by the chorten. Yungdrung Bön scriptural texts are always placed in the highest possible position with nothing on a level above them. They are considered even more important than an image of the Buddha because they contain the actual teachings and guidance that leads sentient beings out of their suffering. Sometimes they are placed on the same level with the deity statues due to limited space. Generally, statues and yidam torma are placed on the level below the texts. 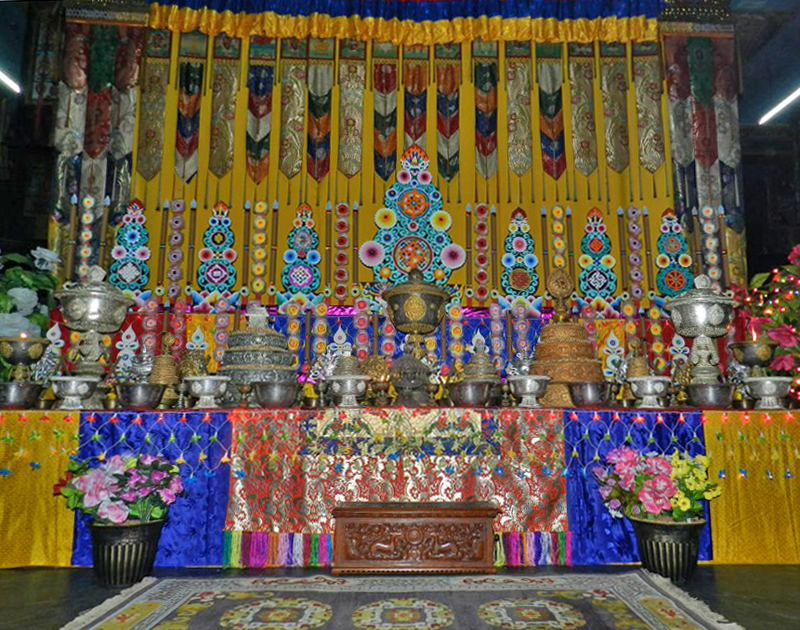 Images of high lamas are placed below the statues. If there is only a single lama image, it should be placed in the center. 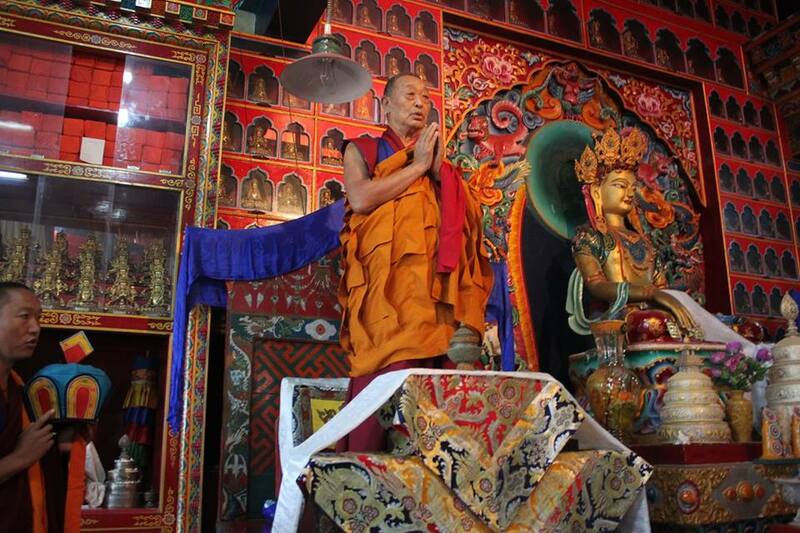 If there is more than one lama image, the image of the highest status lama is placed to the practitioner’s left and the second highest status lama is placed to the right. The third highest status lama image is placed to the left of the first image, etc. The Lower Levels of the Altar: Offerings to the deities are placed on the lower levels of the altar. 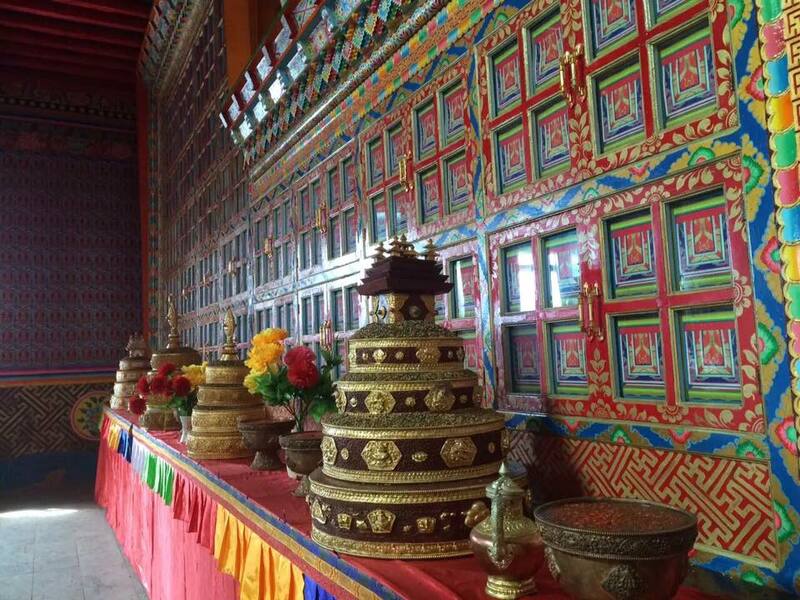 Most important are the five daily offerings of butter lamps, incense, clean water, food and flowers. (See previous post The Five External Daily Offerings https://ravencypresswood.com/2017/01/14/the-five-daily-offerings/.) Mandala rings are ritually filled with dry barley or rice and placed as an offering. If there is only one mandala, it is placed in the center. If there are two mandalas, they are placed to the left and right. Flowers are placed to the side of the altar and burning incense is placed below. Mandala offering with the unique Yungdrung Bon square top. Photo credit: Unknown. Once everything has been properly established, the altar is ritually cleansed with the sprinkling of clean water and the smoke of pure incense together with their respective mantra. Everything is imagined as being completely pure. The practitioner then performs at least three prostrations of body, speech and mind with a heart of devotion. At this time, the altar has been ‘opened’. From this time until it is ‘closed’ in the evening, one must perform prostrations before approaching the altar. Out of respect, whenever approaching the altar when it is ‘open’, the mouth is covered as a way to keep it completely pure and clean. According to the texts, the altar is opened in the morning ‘when the birds leave their nest’ and closed in the afternoon when ‘the birds return to their nest.’ This is generally considered to be dawn and late afternoon before sunset. When acquiring items for the altar, setting it up, and opening and closing it each day, one imagines that by engaging in this virtuous activity, that the five poisons of ignorance, anger, attachment, pride and jealousy are purified. Posted on January 28, 2017, in Prayer and Ritual, Uncategorized. Bookmark the permalink. Leave a comment.